We're through with school! So that means we're back on track with our blog posts as well ;) Throughout the whole time we've been a little MIA on reviews, we've also accumulated quite a lot of beauty products and have been trying them out so do expect some interesting posts coming your way! Now, this is not a new face to the many of you out there, but it's something that I've been using every single day ever since I received in my goodie bag from the benefit store opening at Westgate. 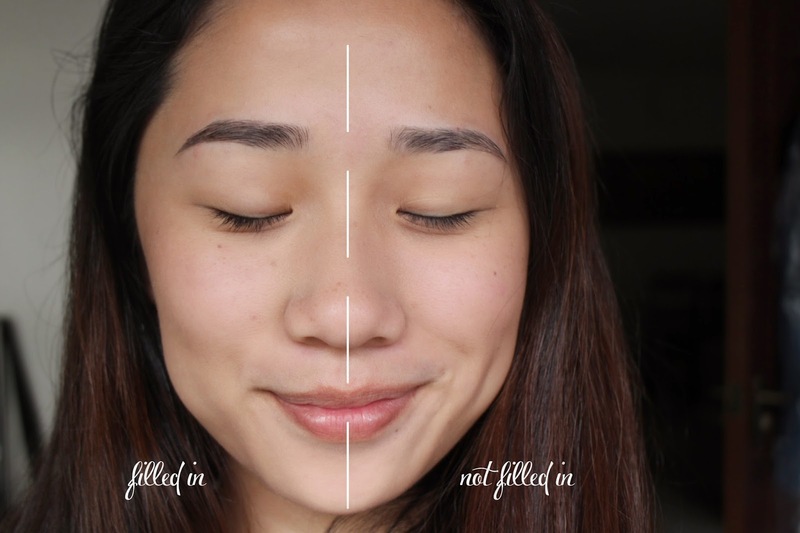 It is my holy grail brow product and here's why I am absolutely in loveee with it. Launched in september 2013, Benefit's gimme brows is a brush-on fibre gel that helps fill in and keeps your brows in place. 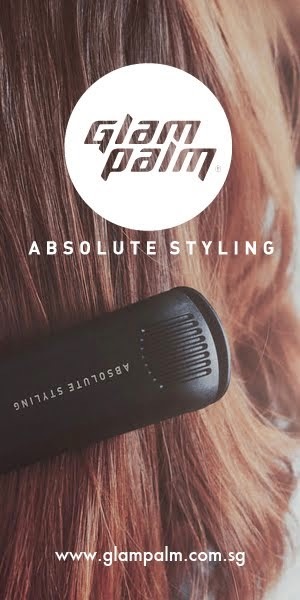 The brush on fibre-gel itself very lightweight, you literally don't feeling anything whilst the product is being applied. 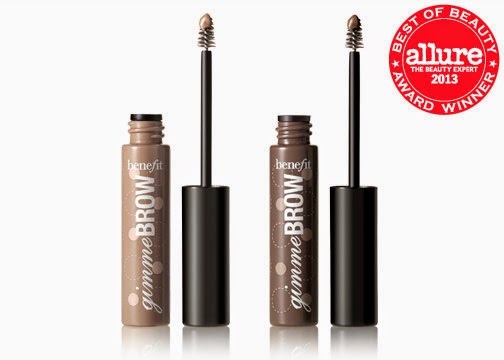 Benefit's gimme brows offer a 2-in-one finish upon application and has just made my getting ready process a whole lot faster. 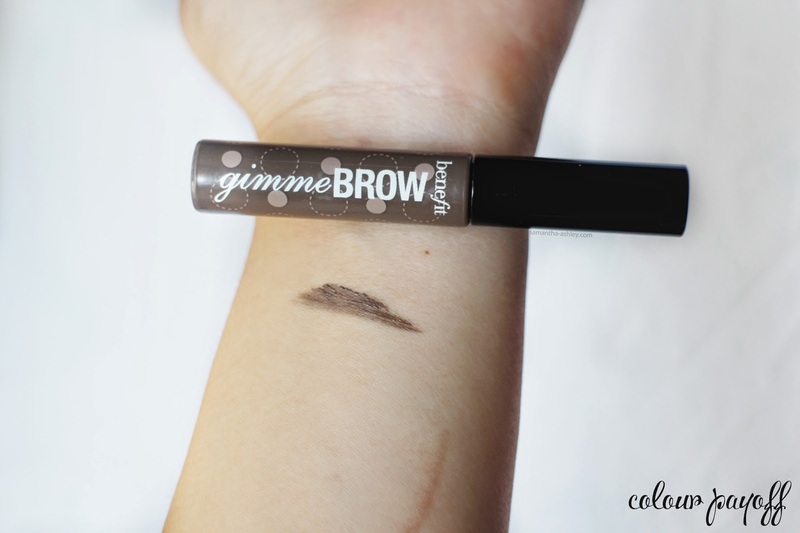 I used to use the Top Shop brow pencil for the longest time and although there were no problems with it, there was nothing too particular that made me want to go back and repurchase it should I run out. 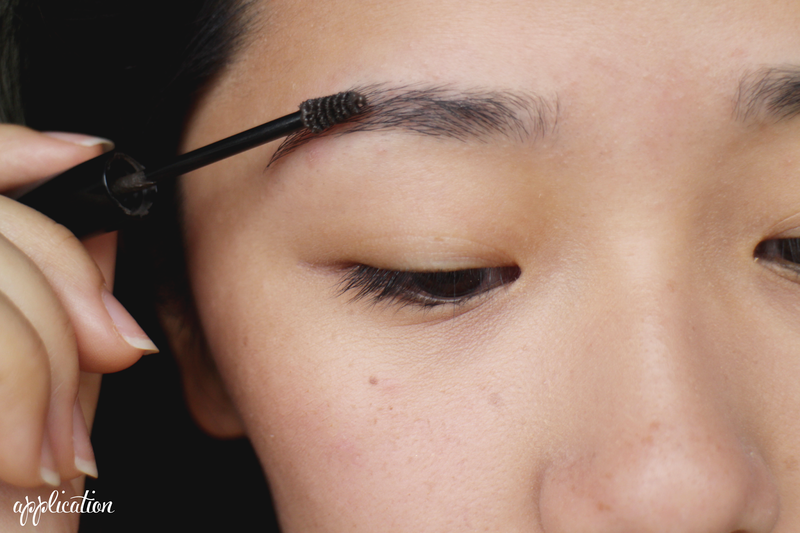 I would also go over my drawn brows with the No.7 brow gel to set them in place. Now, my routine has been cut short with just a simple step! There's nothing too special about the packaging, it is quite literally packaged like any other mascara but smaller so it's perfect to take on the go! In my opinion, the wand itself is short to help provide a more realistic finish and for the ease of application through the curves / shape of your brow. I've always been a little skeptical about the color payoff of brow products in fear that they look too fake and behold, the colour shows up true to the packaging! What I like about it that it is pigmented but not too intense. There are two shades available ( light/medium and medium/deep) for the range but I do have very thick brows and felt that the darker shade helped filled in the sparse areas better! It pretty much works just like a mascara but for your brows! All you have to do is run it through your brows, with short strokes to fill in any sparse areas to create a more polished look. I recommended looking at a mirror that isn't too close to you because I find that I over-fill and my brows ended up looking wayyyy too dark. I went off to get my brows done prior to getting this post up because my brows were gnarly and it wouldn't be just to show the effects of this amazing brow product against a messy canvas. So, here's a quick before and after waxing both shots were taken without makeup on! 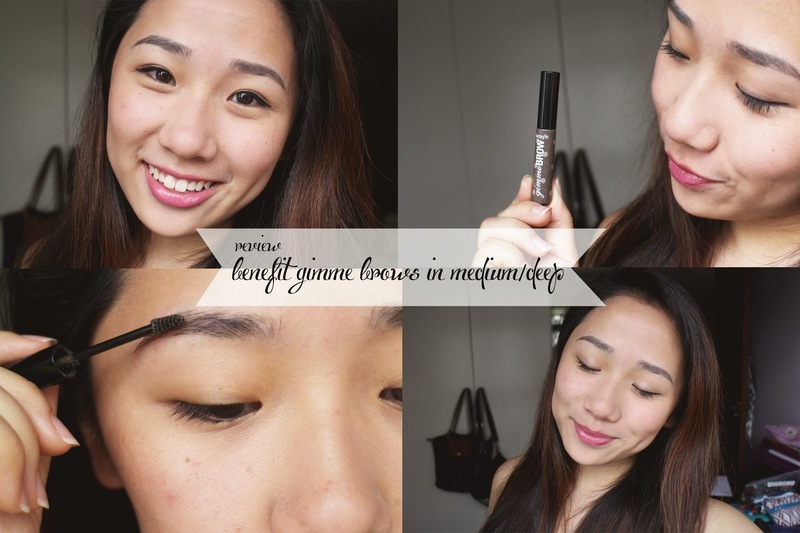 I've heard and seen amazing things about benefit's brow bar and I just had to try them out. I've personally never gotten my brows waxed before so it was surprised that it didn't hurt at all! I will let you guys know that I did break out around my brow area for a couple days that followed but it is completely natural if it is your first time getting your brows waxed! If you guys would like, I'd be more than happy to blog about my next trip to the benefit brow bar! There isn't a traumatic difference between my brows I am aware as I am blessed with thick brows and only have the sparse areas and the shape to worry about. I really like how the finish is so effortless, without the hassle of worrying that I've applied too much pressure with a pencil where a certain area is darker than the other. I was a girl who never believed that brows made a difference, but now I beg to differ. It makes all the difference. It creates a more polished and complete look and I can't believe I've gone all these years without making my brows a top priority! For those of you out there who find filling in your brows a little intimidating, don't be! 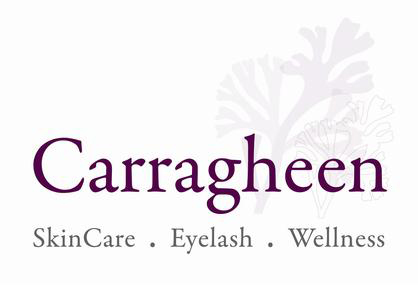 Brows frame our face and although you might see photo references of people who have seriously thick brows, there are so many for us to choose from that there's bound to be one just for you! This product is also sweat proof! Perfect for those of us living in hot and humid countries because the last thing we want is to accidentally rub our brows and have the product smeared across our forehead. It's definitely a great piece to have if you are just starting out in makeup, it's hassle free and so easy to use! Perhaps another product you might want to add to your list next time you stop by the benefit counters. P.S: We know that you beauty junkies love shopping online so we've found an amazing deal for you! 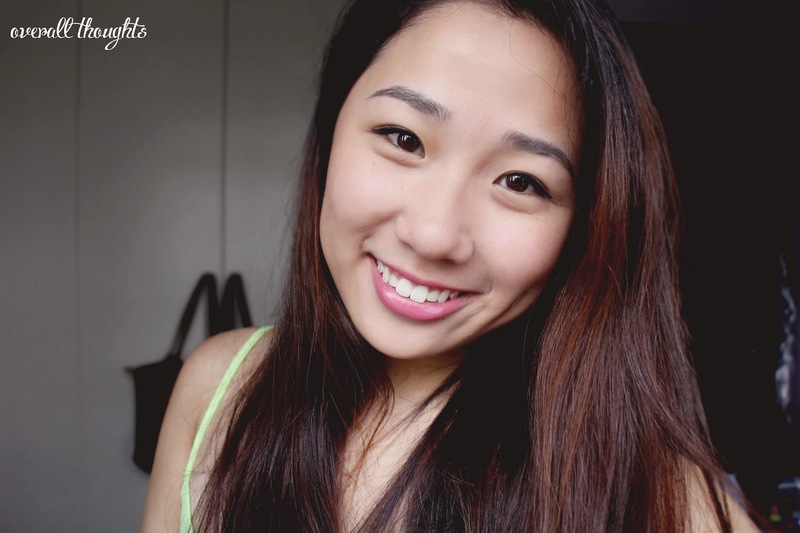 Click here for a Luxola Singapore 10% off store-wide coupon on all things makeup! Awh thank you :) waxing truly made the difference I feel, you should definitely give it a try, it will be the best brow product you'll ever own! ;) I can't go without it when I've got makeup on for the day! Thanks Holly <3 It's truly my holy grail product! Very nice! I was skeptical about this product, but it looks very natural! hi, thanks for the review! i love your lip color too! wanted to see what you are wearing? Thanks.